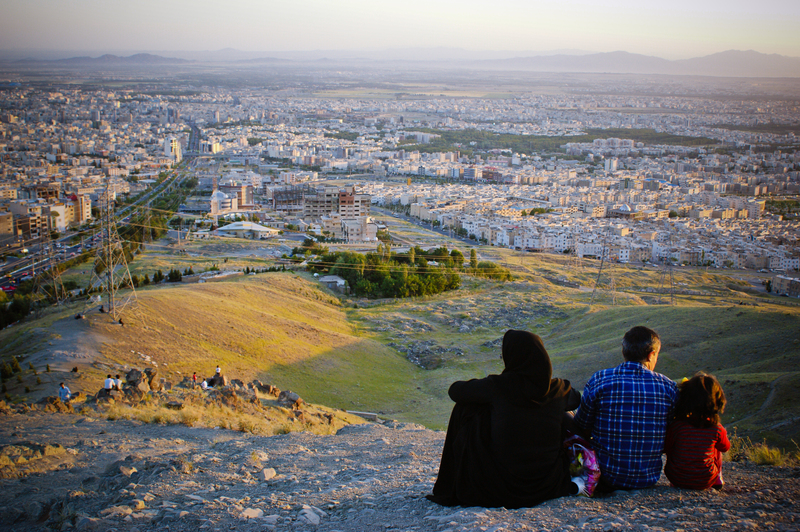 A couple and their daughter – nine years old, so not required to hide her hair and body from view by Iranian law until her next birthday – sit near the summit of Mount Karaj and survey the evening scene. 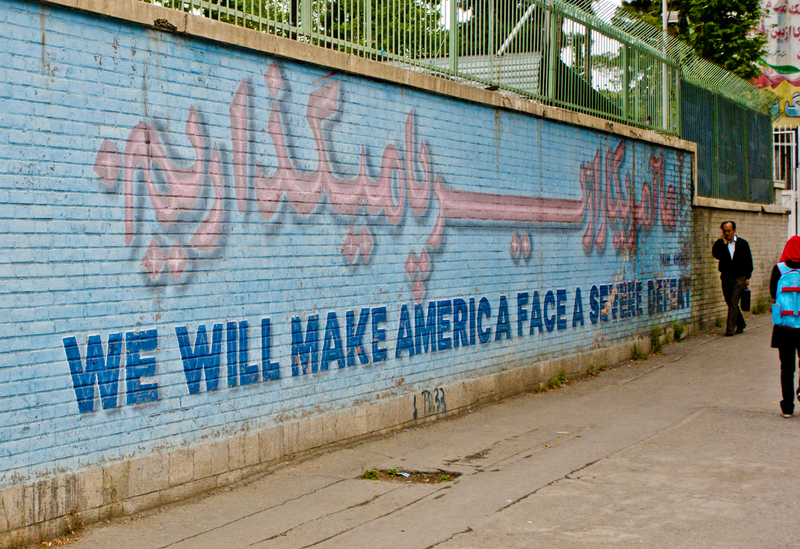 You will take taxis in Tehran. That’s a fact. I learned some lessons so that you don’t have to. This article will ruin the fun of finding things out on your own the ‘hard’ way. Lesson 2 – Please refrain from calling your taxi driver a donkey! My friend Iman, the gregarious Tehrani, tells the driver to pull up anywhere in the nearby vicinity. The driver informs Iman that that just won’t be possible. The rush hour traffic is becoming increasingly intense as we approach Vanak square in the North of Tehran. The only problem is that Iman has a class starting in ten minutes. We are exactly an eleven minute jog from the school. Iman is the teacher. This makes the driver look as though he’s going to cry. As if we’ve just double-team french-kissed his grandmother. ‘Take that back immediately!’ he begs. Iman denies this request, replying instead with ‘Your father is a donkey!’. By this point, we are beginning to jog away from the taxi across lanes of rush hour traffic. The taxi driver is so insulted that he pulls up the handbrake and abandons his vehicle, following us on foot through the flow of traffic. He is desperate to have the insult withdrawn, as if it were an indelible stain to remain upon his person forever. ‘Take that back!’ he screams as he picks up the pace. Now I’m running down Valiasr avenue, away from a livid taxi driver, who is removing his belt from his trousers in order to beat us with it. What a bunch of donkeys we are. After hiking the perimeter wall of the ‘American Den of Espionage’ (the old embassy of the US of A), seeing all of the CCTV cameras at five metre intervals, the ‘No Photography’ signs, and the guards standing at each corner with AK47 rifles, I decided that it was just too damn photogenic to let the opportunity pass me by. These days it’s the HQ of the Sepah militia (the Army of the Guardians of the Islamic Revolution). With sweaty palms, I dodged between Sycamore trees and took this picture. Lesson 1 – Don’t slam the doors and expect to get away with it! My friend Iman, a gregarious Tehrani, enters ahead of me. He lands on the middle seat next to a dazzling beauty with hair like a beehive underneath her hijab. I catapult in and slam the door behind me. The car’s frame reverberates. Outside, the first smatterings of rain hit the windscreen but I find my gaze being drawn upwards until it meets the driver’s in the rearview mirror. His stare holds mine as he speaks. Iman translates. ‘He welcomes a very strong man to his car. It’s not everyday that he has the pleasure of meeting someone with such impressive upper-body strength’. It’s my first taste of Persian sarcasm. The taxi drivers of Tehran’s Paykan fleet – rusty, trusty automotive relics from the era of the last Shah of Iran – are highly protective of their vehicles. These great hulks of steel lived through the Islamic revolution, the Iran-Iraq war, and the last forty years of wear and tear. You’d be protective too if you relied upon a leaded petrol guzzling antique to keep food on your family’s table. After he’s said his piece, Iman apologises on my behalf and explains that I’m from the UK. ‘Inglestan?’ An enormous smile spreads across his face, an arm is thrown off the steering wheel and into the air with enthusiastic welcome after enthusiastic welcome shouted. Iman turns to me. ‘He says you are most welcome in Iran and he offers to do anything he can to make your visit more comfortable. He now understands why you closed the door so aggressively. He says he has heard stories of the wonderful taxis you have in London – surely they are able to take that kind of abuse. Please forgive his poor quality car. It is very old and falling apart. He would very much like one of those new Peugeots’. ‘I like old cars very much’, I say. He drops us at Vanak Square in the north of Tehran. We try five times to press money for the thirty-five kilometre journey into his hands but he refuses each time – going above and beyond the number of attempts required in Iran to give someone a chance to back out without losing face. ‘You are our guest!’ he shouts from the window as he rejoins the flow of cars. The next day, I close the door of a shared taxi so pathetically out of fear of rebuke, that it causes the taxi driver to comment that I’m surely a feeble-bodied Turk from the city of Tabriz in Iran’s North-West. It seems that there’s a fine line. When you go to Tehran, try to nail that elusive medium. The textbook closure of a Paykan taxi door. As soon as we stepped outside of the car, we were blasted with intense heat. 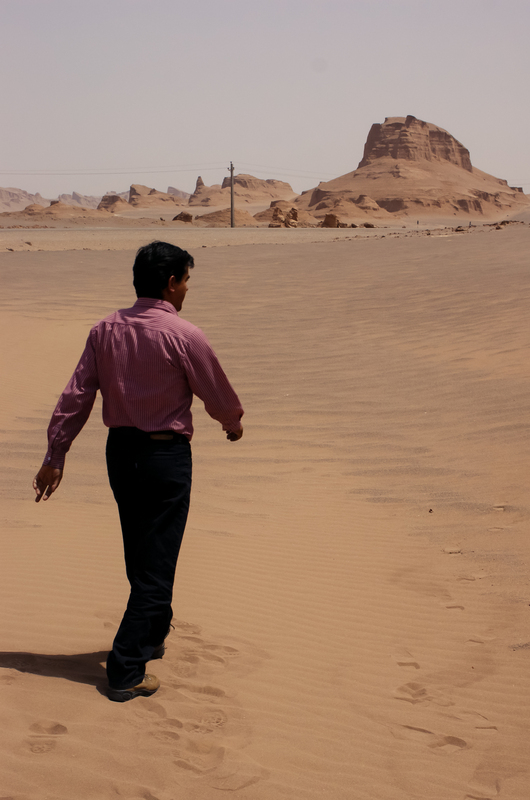 This was the Kaluts desert (Dasht-e Luts) in South-East Iran, heading for the Afghanistan/Pakistan border. It was one of the most extreme places I’ve ever visited. This feeling was exacerbated by the fact that my hosts were high as kites on opium. 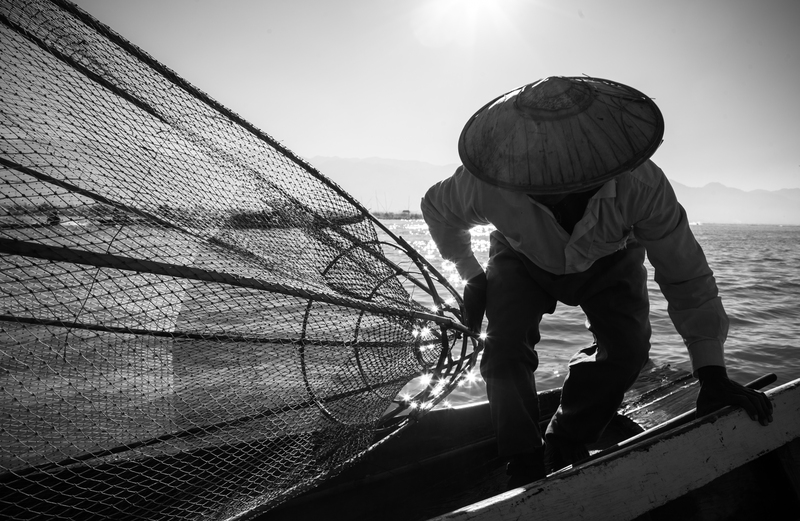 A fisherman steadies his boat against the side of another – Inle Lake, Myanmar. He’s an Intha – a member of a Tibeto-Burman ethnic group living around the lake – famed for their leg-rowing technique and for living off produce grown on floating gardens. Some entrepreneurial fishermen have recently decided that it makes more financial sense to catch one fish in the morning then pose with it for tourist photos at $1 a pop. A lucrative business indeed. 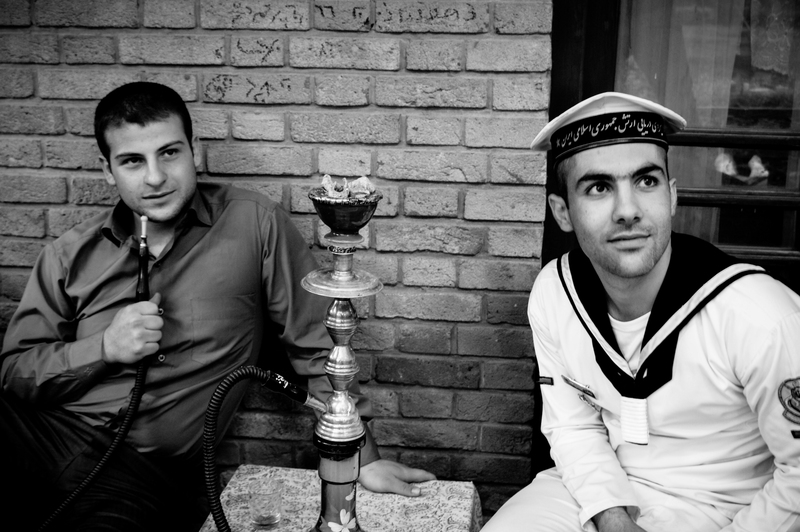 An Iranian Navy sailor and civilian friend enjoy a ‘Qalyan’ – a hookah water pipe – in Tehran’s Park-e Laleh, Iran.